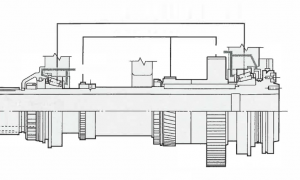 POWER MASTER N Series encompasses large flat bed CNC turning centers. The POWER MASTER Universal is designed for the heavy-duty cutting of large-diameter, long shaft work pieces. The POWER MASTER Chucker models are perfect for large-diameter ring type workpieces that do not require a tailstock. The machines feature flat-bed constructions for easy access and superior chip flow. Plus, the spindles can be configured with various size bores, up to 14.75″ for large diameter pipes and shaft work. The POWER MASTER N is a proven workhouse in the energy service and power generation industry. The outer wall of the headstock is thick to withstand heavy cutting at high speeds, and the hardened, ground spindle has a thick front portion of 178mm(7″) in diameter with solid support from ultraprecision taper roller bearings. Since spindle speed changes are accomplished with the 4-step shift, there is little heat generated and great turning torque results. Using a 4-step hydraulic shift that makes for minimal thermal distortion, the headstock features a maximum torque of 7208 N•m(5310 ft•lbs) – twice the torque of conventional machines. 45 kW(60 HP) AC drive handles large diameter cutting of work up to 600 mm (23 1/2″), slashing time in the cut tremendously. Automatic stepless spindle speeds from 2 to 1200 rpm and Constant Surface Speed are standard, making for easy programming, prolonged tool life, and better finish results. 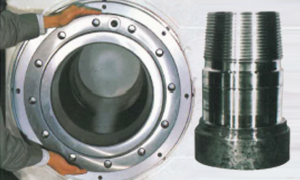 The standard spindle bore is 118mm (4-5/8″), but 260mm (10.2″), 320mm (12-1/2″), 375mm (14-3/4″) and *530mm (20-3/4″), hole diameters are also available. The Meehanite cast bed and base are of a single piece. Unusually wide and featuring ribbed construction it is exceptional for its rigidity. The 2 ways of single vee design are first flame-hardened and then precision-ground to assure high precision for the long run. Careful consideration has been given to chip flow. 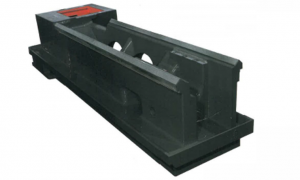 The angular, ribbed construction assures smooth chip disposal.